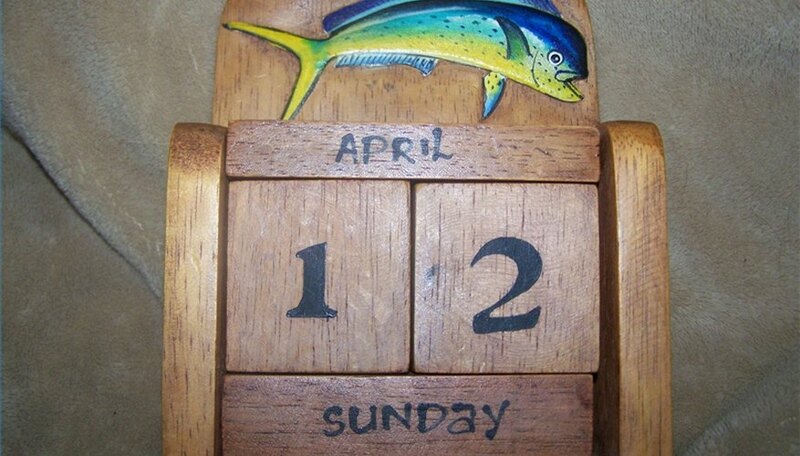 Perpetual calendars are calendars that have pieces that can be moved around to change the date. This allows you to use the same pieces for each month and since there is no year attached to it, it can be used forever. This is a woodworking project where you will need to know how to cut the wooden pieces with a saw, but it's not difficult. It will take at least two days to complete. Make the frame. Cut two pieces of 5/8-inch thick wood, 4 inches by 2 3/8 inches, for the sides. Cut one piece 5 1/2 inches by 2 3/8 inches for the bottom. For the back, cut 7 1/4 inches by 5 1/2 inches. Sand each piece down with a medium grit sandpaper and then a fine grit sandpaper to smooth out the wood. Using wood glue, glue the bottom to the back, using the two 5 1/2-inch pieces. Use the pin nailer to nail the pieces together and hold them in place. Then glue on the sides to the back and the bottom matching the 2 3/8 measurement to the bottom and going up the back 4 inches. Nail the sides on and allow the glue to dry for several hours. Cut two pieces from the 1-inch wood, each 4 3/16 inch long and 1 inch wide. 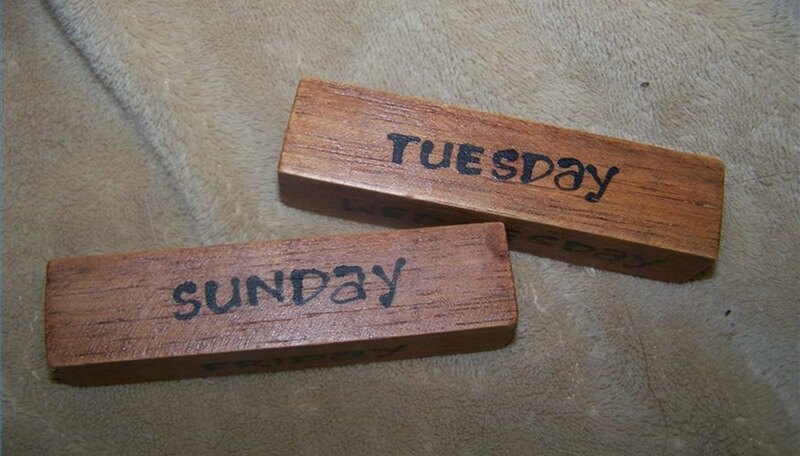 These blocks will contain the days of the week. Sand them down to make them smooth and stain or paint them. Put them aside to dry. Cut two blocks of wood from the 2 1/8-inch wood, each 2 1/8-inch by 2 1/8-inch. These cubes be used to display the numbers that you can arrange for the date. 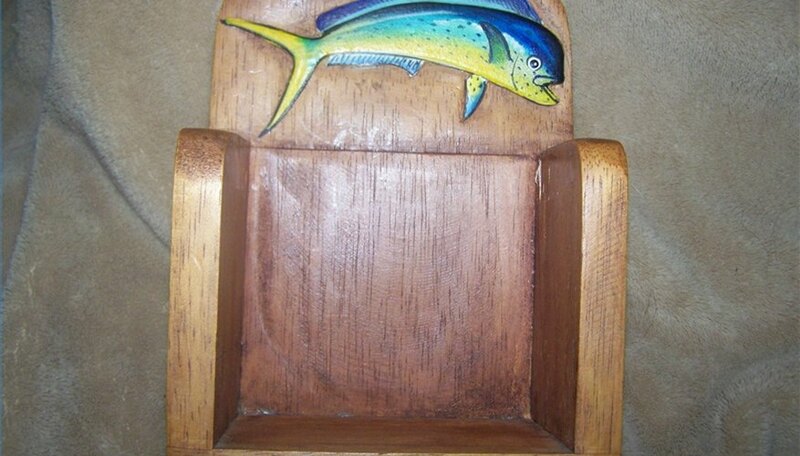 Sand them and then stain or paint and allow to dry. Cut three pieces from the 5/8-inch thick wood, 4 5/16 inch long and 5/8 inch wide. These three pieces will be months of the year. Sand them down to make them smooth and stain or paint them and allow them to dry. Paint or stain the frame now that the glue has had time to dry. You can add your favorite design or use stencils to paint on the family name to the top of the wood frame. Paint on the months of the year onto your 4 5/16 inch-long strips. Paint January through April on the first strip, with each month on a different side. Paint May through August on the second strip and September through December on the third. Paint the numbers on the cubes. The first cube should have the numbers 1 through 4 on the sides, 5 on the top and 0 on the bottom. The second cube should have 1, 2, 6 and 7 on the sides, 8 on the top and 0 on the bottom. The 6 can also be used as a 9. Paint the days of the week with one on each side of a 4 3/16-inch block. This will leave one side blank. 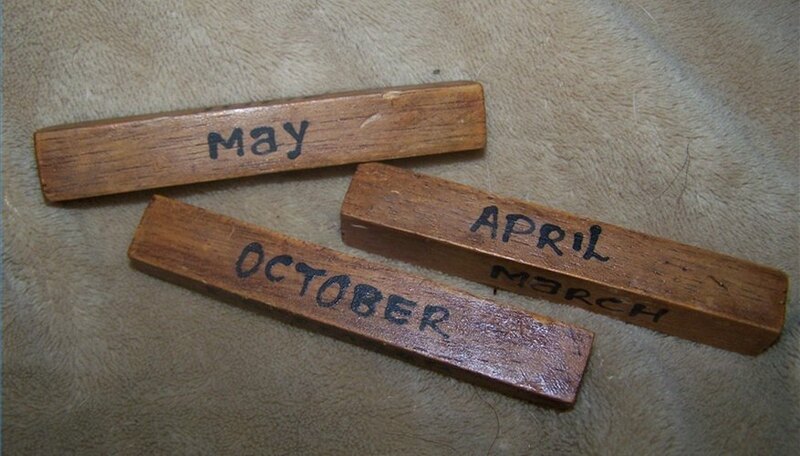 Allow all the paint to dry and then apply a wood sealer to all of the pieces of your calendar if it was stained. If it was painted, you will not need the sealer. Put the calendar together by placing the months of the year on the bottom, one in front of the other with the current day showing. Then put the blocks on with the current date showing. Next top it off with the days of the week by putting one towards the back and the other one in the front with the current month showing.